Remember a few weeks ago when I commented on the story that suggested mandatory menu board calories actually increased consumption? I pointed out that the data therein referred to a very specific subset of New Yorkers and likely wouldn't be reflective of a generalizable pattern. Well, guess what. We've got more data. Two days ago at the Obesity Society meeting in Washington, the New York City Department of Health presented their preliminary findings. Looking at 13 different fast food restaurants and over 275 locations the NYC folks analyzed 10,965 receipts just prior to mandatory menuboard labeling and 12,153 receipts in spring 2009. They also had folks complete a quick survey. In fast food restaurants the number of patrons who reported seeing the information rose from 11% pre-initiative to 56% after, and in coffee shops (like Starbucks and Dunkin' Donuts) the number rose from 1.9% to 54.8%. According to their survey roughly 25% of folks who reported seeing the information reported using the information to help them with their decisions. 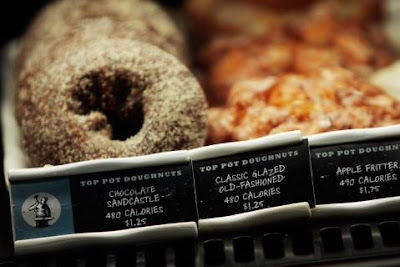 Overall it was found that calories did reduce post menuboard labeling. Reductions were found in 11 of the 13 restaurants with one notable outlier - Subway. In Subway calories increased - and they increased a lot, on average Subway patrons consumed 114 calories more post menuboard calories than before. So does that mean menuboard calories are a dud? Looking at the Subway data researchers found that the increase corresponded with a dramatic increase in the number of foot long subs purchased compared with 6 inchers. The increase likely occurred as a consequence of the $5 foot long campaign. Tellingly however when they looked at the calories consumed per 6 inch and per foot long before and after menuboard calorie posting, turns out that while more footlongs are being consumed, their calories are lower. Looking specifically at the folks who reported using the information, they decreased their average lunch time calories by 106, though weren't able to decrease much at the coffee shops (a non-statistically significant 14). There are some limitations to these data. Firstly the economy in 2009 is very different than in 2007 and this in turn may impact on purchasing trends. Secondly the study would fail to capture those people who in response to menuboard calorie posting stopped eating at fast food restaurants. Lastly we're still only talking about fast food. Perhaps in the fast casual restaurants, where there's a greater selection, we'll see different results. Stay tuned tomorrow for more breaking news on calorie posting and some fascinating work from Kelly Brownell and his friends at the Rudd Centre.